A composite illustration built up from individual plates within the book Conchyliologie systematique, et classification methodique des coquilles ...by Pierre Denys de Montford (2 volumes, Paris, 1808-1810). Each specimen of foraminifera [single-celled marine organisms with shells] is inscribed with De Montford’s “genre” number and a brief caption. Each appears with an indication of the actual size of the specimen, drawn alongside the magnified illustration. 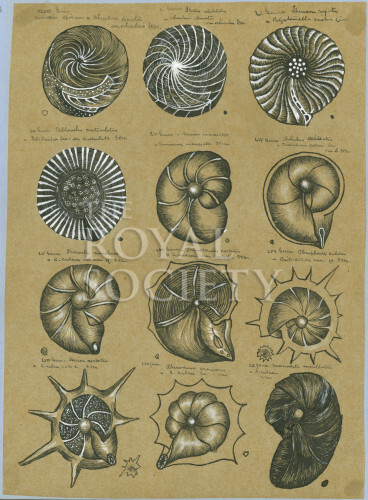 One of a series of copied illustrations from printed sources on foraminifera, largely from the 1850s but also drawing upon earlier sources. It is likely that Brady was tracing, colouring and note-taking to train himself in the recognition and nomenclature of these shelled marine protozoans. Presented to the Royal Society as part of the Brady Library: The donation is recorded in Council Minutes: “Read a letter from Prof.G.S.Brady, communicating the following extracts from the Will of his brother, the late Henry Bowman Brady:- ‘I bequeath all my books and papers relating to the Protozoa to the Royal Society of London...said books and papers should be kept together...’ The Secretary was directed to answer that the Society gratefully accept the valuable gifts...” [Royal Society Council Minutes Printed, 1884-92, vol.6 p.349 19 February 1891]. The naturalist and pharmacist Henry Bowman Brady published scientific papers on protozoa from the 1860s and is best known for his contribution to the HMS Challenger oceanographic expedition. Report on the foraminifera dredged by HMS Challenger during the years 1873-1876 (1884).